I'll admit, I cut it a little close with the nail art for today's prompt... If you follow me on Instagram, you may have seen that my green nails almost turned out differently. Thankfully, I scrapped the idea of making my nails look like lettuce last minute and decided to attempt nails that looked like jade. I used three colors for this look: Essie Blanc, Sally Hansen Jaded, and OPI Jade is the New Black. How apropos, right? The process for these nails reminded me of the process for my tortoiseshell nails. Here's a short little tutorial for you! Start with one coat of Sally Hansen Jaded (jade colored jelly). Using tweezers and small torn pieces of a triangle makeup wedge, sponge on random areas of Essie Blanc (white) and OPI Jade is the New Black (rich green). Be sure to leave some space unsponged. Add another coat of Jaded. It's jellylike consistency will add a cloudy effect over your sponging without covering it up. Repeat your sponging, but in different areas this time. Add a final coat of Jaded to create depth. Using a small nail art brush, add some thin "veins" of white on top. A little bit goes a long way here. Finish with topcoat for the polished gemstone look. I also wanted to add a little bit extra to the manicure, so I placed some metallic caviar beads from Born Pretty near the base of the nails as an accent. I think they do a lot to add to the antique effect -- these nails almost look like found artifacts! I wish I could have captured the depth of these nails better in the photographs. I can really see the differences between the layers in person! My green nails from 2012! My green nails from 2011! Wish you actually had tutorial pictures or a video :/ cute nails though. Sorry, tutorials take a long time to put together! If there's a part of the description you don't understand, please let me know and I will try to clarify. I am so doing this!! So gorgeous!! Please be sure to share pics iwth me if you do! Will do! I had so much fun re-creating your tortoiseshell design! Wow! 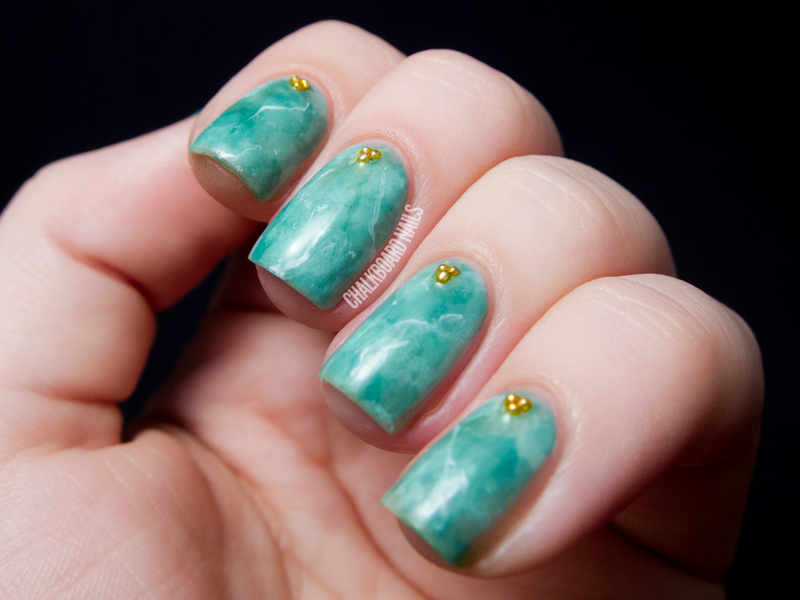 Jade is not one of my favorite things but these came out so well! They look like real jade! Awesome job! this is INSANE. it looks like stone! This looks so sophisticated and stunning! These are fab! i so miss being able to increase my jade jewelry collection now...jade has all but dried up on the market unless you want to pay huge prices for both good jade and the price of gold. That is just stunning! 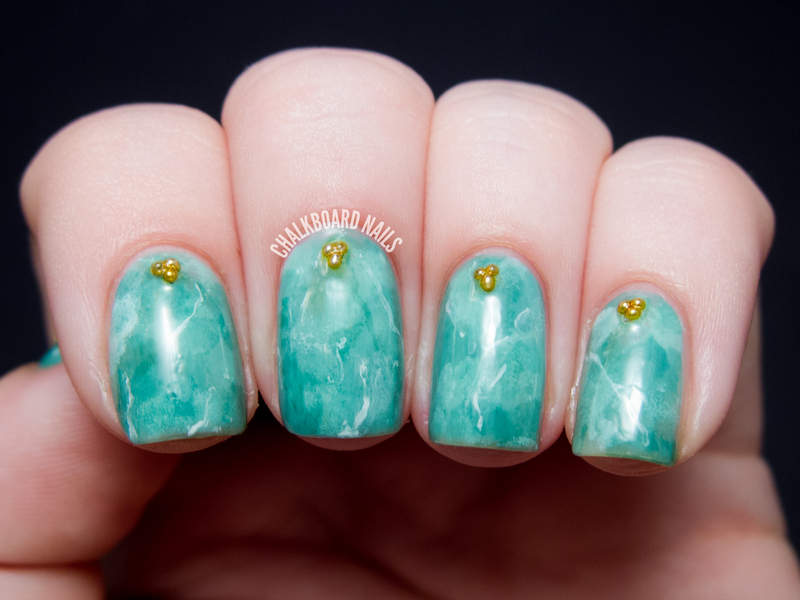 It looks like Italian marble! Whoa stunning!! These looks like the IDEAL marble nail art! Definitely need to give this a try! Thank you so much for the quick yet informative tutorial! This is just stunning! I can't stop staring at your pictures! This looks very realistic! Wonderful design! 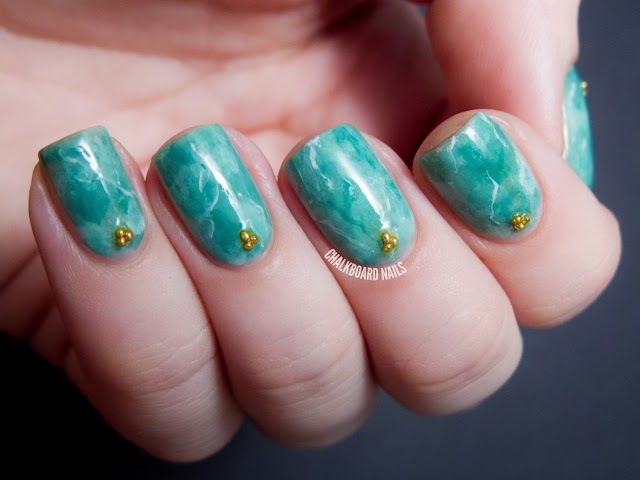 Uau... Now I wish I had a jad jelly polish to try to do this design. Beautiful look! To me, your nails look like dinosaur eggs (not that I would know how dinosaur eggs really looked like). this is amazing, it really looks exactly like jade! This came out so ridiculously gorgeous! Seriously! Absolutely adore it! i crazy love that look! Wow, they are amazing! I'm amazed how you even thought of doing this. So incredible! I love these. They look so friggin awesomazing! Absolutely stunning. These are amazing! 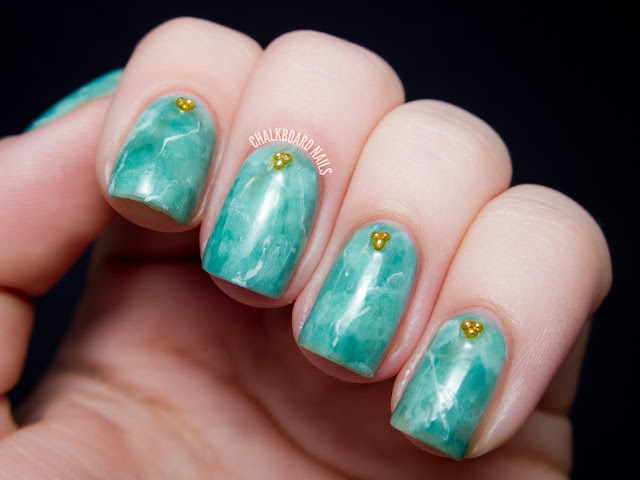 These are absolutely perfect and I love how you layered the jelly in between! Beautiful!! I would love to be able to do this! I love jade, so this hit the perfect mark for me. I will say, the lettuce nails had charm too. I'd never have guessed you sponged these! They're really cool - the gold definitely sets them off. I wish you'd stop calling the other ones 'lettuce' nails though since they were obviously zombie brain nails. You are a master! 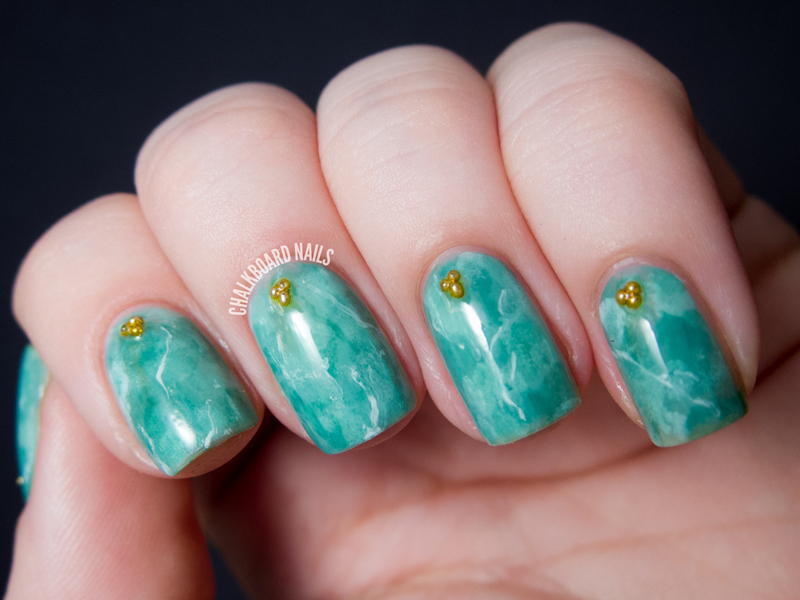 They look like real marble! Great! I tried to recreate this look, I really like how mine turned out, but it doesn't look as perfect as yours! You should share a pic! 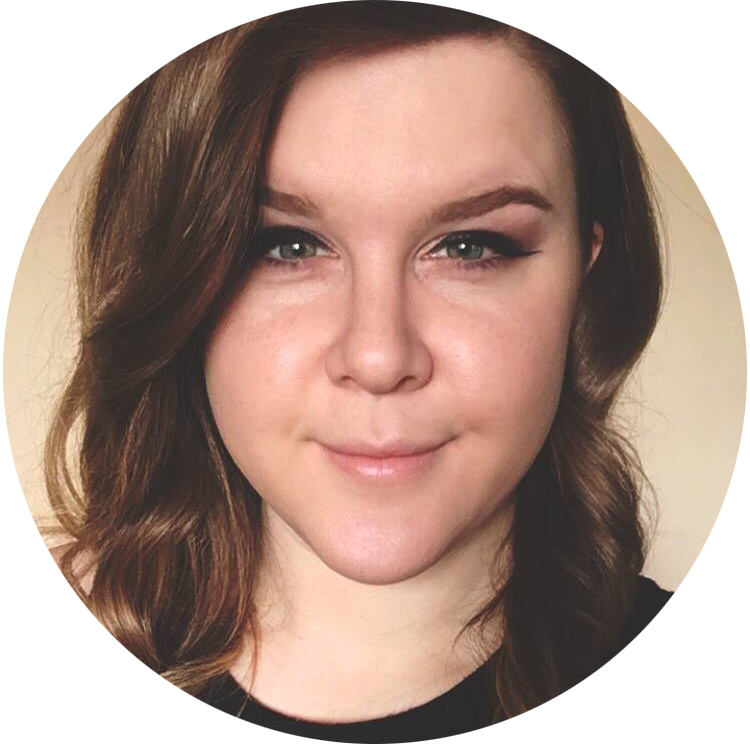 I think you can attach pics to comments here or you can post it to the CN Facebook wall! Ah, I'm just loving everything! i got to stage 5 and messed up stage 6 so badly, but then worked out a slightly simpler method. drop a small blob of white onto a surface you can mix nail varnish on, drop a huge blob of clear coat over your white, about 4 times what you have with the white, swirl them together a little bit, not so they're that mixed at all. use a standard brush to apply the mix, clear and white polish will go on the brush and make that misty effect. so much easier than trying to get those little lines right!